I would like to believe it is true that the government has done none to preserve the beach trees. I browsed DA website, including BFAR but found nothing but fish, fish, fish, cage, cage, cage, tilapia, tilapia, tilapia, etc. But i still believe there is or there was a long term program to this. long time ago in cooperation with the European Union. Koddi, where are you? Eeek pod diha. mao ni ihampak sa agtang adtong nagpaputol sa kahoy! in the first place, it was the concerned local Brunei residents who made the government to act helping save the trees. the voice of the people made themselves heard before the trees are gone, forever. in Guindulman, it was different. after the trees fell, so were the reactions abound. the voices came, but the trees were long gone. aren't the local residents any caring and concerned? did someone try to stop the chainsaw and make a trip to the mayor's office? too bad if no one ever lifted a finger, even among those habal-habal operators and block-tienda owners, to impact a bit of awareness about the impending death of the magnificent trees. we have misplaced our courage. we root for a candidate to the last drop of our blood, as we've witnessed here at TB, yet not a single voice was heard to rally against the order while the trees were still standing. but i know, most of our people have been always complacent and disconcertingly alien to our ecology. and, sadly, many have more to worry about than caring our environment; that the thud of a falling tree would only mean nothing but firewood and building materials. business as usual. very well said Glace! maka hinuklog man sad ni kaajo oi! Tinuod gyud na, pero kahibalo na baya ka ang kabus nga lungsod dili intawon kapiyok sa mga leaders tungod kay mahadlok, mauwaw, maikog, walay igong katakus nga musokol. Question? Asa man ang mga civic leaders og religious leaders sa community adtong panahuna. agiii! ang imong ginaingong religious leaders! hahaha! ato man kaha sad to sabwagan sa maaayong balita, Cryst?? let me know ganus a ta mo largin, kay murag chaotic pa kaajo sa ato agi sa piniliay. Look @ the trees,how proud and watchful they are ! -save mommy Earth,avoid cutting the trees ! Pagkahuman ug tumba sa kahoy ayha pa naminghoy. ang mga habal-habal busy pa ug pamasahero. ang mga vendors busy pa ug baligya ug snow bear ug juicy fruit. ang uban nga dili busy, nanan-aw lang. wala magpakabana kay walay koneksyon sa kagutom sa ilang tiyan ang acacia. labi na sa mga pobre sa Guindulman. Posible dihay milabay nga dato apan wala lang pod kay amigo or amiga ni Madam Mayor. Or ang ubang dato daw wala lang. Zero social concern. Zero community participation. In short, not to hide my feelings, walay Guindolmanon nga nagpakabana. Kay kon naa pa, sa pagpuong pa lang sa mga sa sanga sa Acacia, diha na untay mipakgang. mag-pruning pa man sa mga sanga (which took about 25 mins to 1 hour per tree, depende sa gidaghanon sa sanga). Mao nga nakaingon ko nga walay nagpakabana nga Guindulmanon. During sa pagpamutol sa Acacia which possibly took a day, naglabay-labay lang sila tanan, SILENTLY. Pagkaputol na ug pagkahipos sa tanan sagbot, ayha pa morag parrot nga pwerteng SABAA kon ngano giputol ila kahoy. Did you see the small trees in the background? They also were not spared in the heartless massacre of Guindulman trees. Pangutana: Kinsay nakabenepisyo sa mga pinutol nga kahoy? 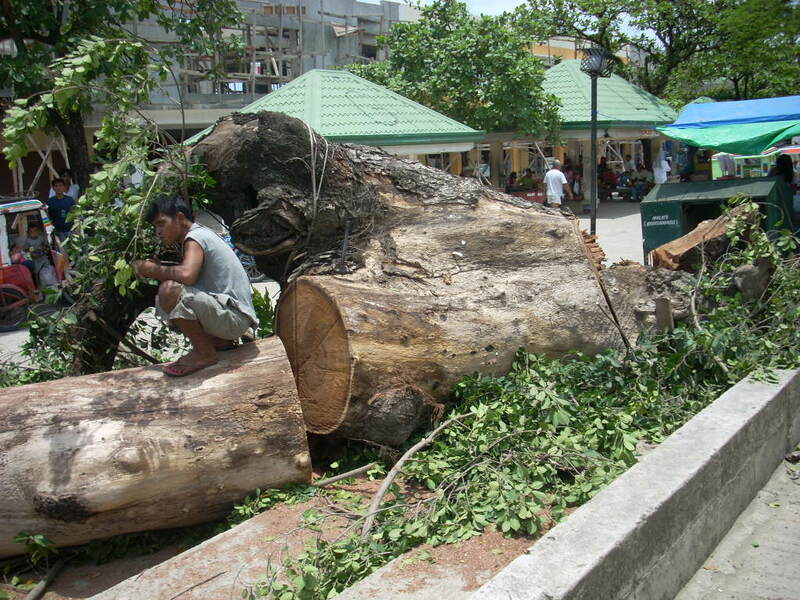 Ang mga tawo nasayod asa gidala ang slaughtered trees. See? unya ning justify pa sila nga daut na ang kahoy! unsay daut nga ka himsug anang uban diha! sus Mike maka high blood jud tan awon! This one was also very healthy. All the branches were green and strong. 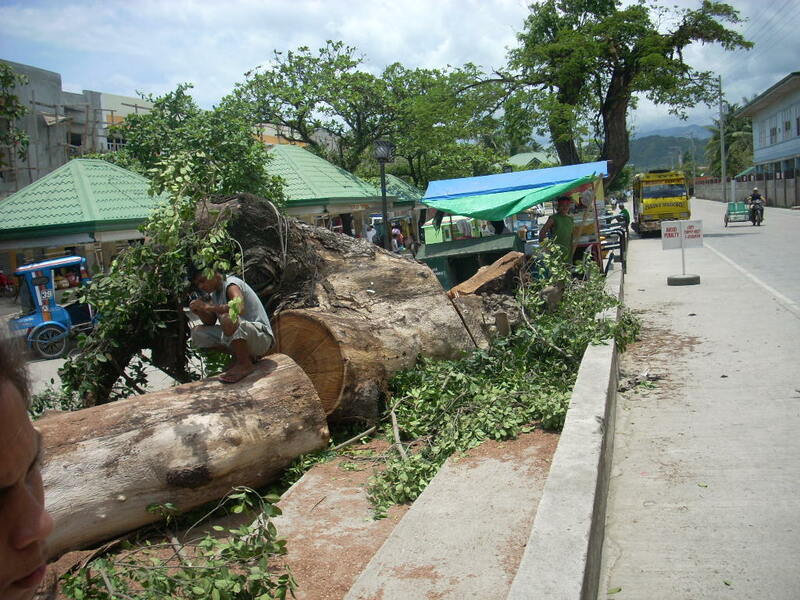 But the stupid LGU of Guindulman murdered this tree. With a little imagination the possibilities are endless..
Days wud be so colorful if.. Mag-ulan ug watercolor!! 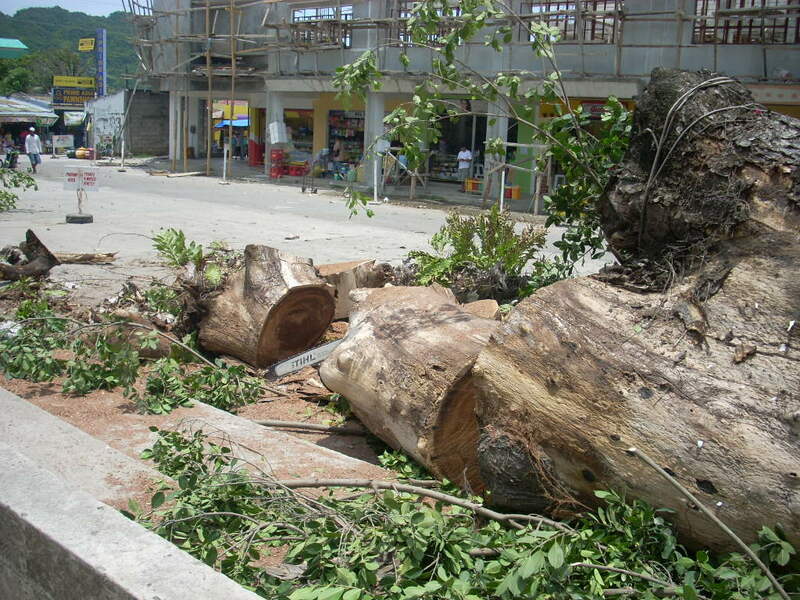 We, the concerned Boholanos residing in the Philippines and overseas, strongly condemn the senseless cutting of century-old acacia trees in the historic town of Guindulman, Bohol. We strongly believe that such acts of the local officials are unforgivable. The acacia trees are not only part of the life and culture of the people, those trees stood witness of the townâ€™s struggles, trials and triumphs. Those trees also show-cased the cultural heritage of the municipality, therefore, the aesthetic values of those trees cannot be at par or compromised with any development project Guindulman undertakes. We believe that persons in authority should be held accountable for their actions. What they did is a total disregard of all environmental efforts in preserving the Mother Nature, not withstanding, the insult they inflicted to the entire generation of Guindulmanons, the Bohol population and the Philippines as a whole. It is a total gross negligence leading us to believe that the incumbent mayor and the members of Sangguniang Bayan apparently abuse their powers and authorities. The Honorable Ma. Fe Piezas, the incumbent mayorâ€™s defense for her irresponsible acts which is for the safety of the public is a total lie. 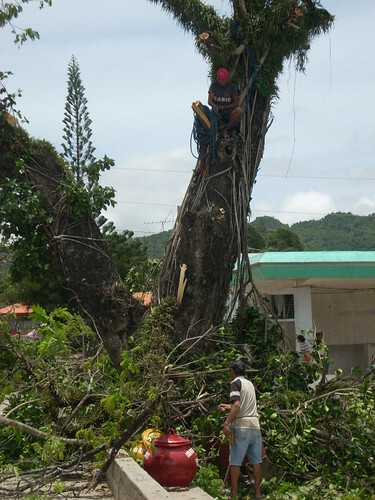 The Pacific Consultant International (PCI), consultants of the Bohol Circumferential Road Improvement Project (BCRIP-2) did not recommend the cutting of the trees when the national highway road was built in 2006. It was indeed illogical that the trees became a hazard three years after the Japanese environmental and structural experts deemed the trees safe and part of the scenic sights along the national highways. It is highly unacceptable that the main purpose for cutting the trees is to give a prominent view of the building claimed by the municipal administration as its major accomplishment or pet project. The damages are irreparable. The Community Environment and Natural Resources Office who issued the special permit is also equally liable with the local officials. No matter how sick and old those trees were, concerned officials must exhaust every possible means to save them. On this aspect, they failed us. It is therefore, our moral obligation to see to it that the perpetrators of this ecological massacre in Guindulman will answer for what they did. The pitiful trees cannot cry or beg for mercy, but we the people can seek justice on their behalf. We should always remember that we did not inherit the environment, we borrow this from our children. More than anything else, on this particular situation, we shall see to it that justice will be served. Moreso, we urge the Department of Environment and Natural Resources to conduct an investigation on this issue, not only in this Guinldulman case, but in all future applications to avoid repetition of committing the same grievous mistakes. Mao na ba gud ning trend nga tanang politiko bakakon, masdin ang Mayor sa Guindulman, nga unta gmay ra man ng lungsura. Here are some excerpts from the article: "Heritage Advocates Mull Mapping of Cultural Sites"
4. She explained that the trees have been suffering from decay as can be gleaned from the colored photos she distributed during the same meeting. The trees cannot be saved anymore because they are dying, she said. UNSANG COLORED PHOTOS? SEGURO NAAY PILA NGA DEPEKTO KAY TIGULANG NAMAN APAN TAN-AWA ANG PICTURES DINHI SA TB.....DI BA DAKONG BAKAK KANA.